A FREE copy of PoseBaby's "The Essential Newborn Photography Guide - Basics & Tips" E-Book will be sent to the email associated with your Amazon account. With newborn photography, one of the most important aspects of creating one-of-a-kind newborn portraits is the base on which the baby is posed. That's why we've created the PoseBaby Pro Newborn Poser! The PoseBaby Pro Infant Posing Pillow is top rated and trusted in the photography industry, specially tested and designed with the input of many Professional Newborn Photographers across the globe. 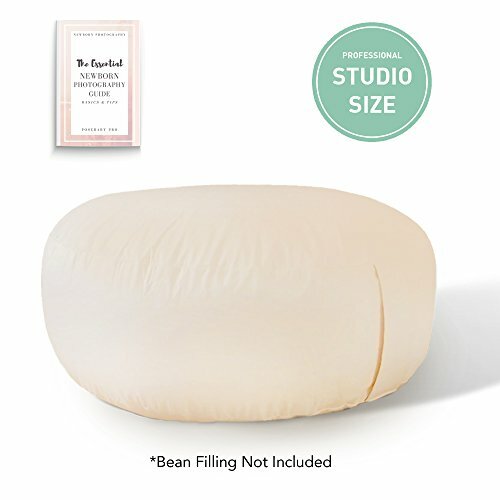 Made with superior faux leather, the PoseBaby Pro Ottoman Bean Bag offers a large impressionable surface area, the perfect amount of grip, a durable safety pull-away zipper, an anti-burst inner bag to ensure easy filling/closure, and is easy to wipe clean after little unexpected accidents. The PoseBaby Pro is unrivaled in the market and will most certainly have an improved effect on all your newborn session images. So, add it to your cart & try the PoseBaby Pro difference today! Don't forget to try our Butterfly Poser and Waterproof Pads! Recommended Filling: 3 to 5 bags of 3.5 Cubic Feet Polystyrene Bean Filling depending on your preference of how soft or firm you'd like it. If you'd like our tips and pointers on how to fill with no spills, please contact us. We'd love to help in any way that we can! HIGH QUALITY SOFT FAUX LEATHER - The PoseBaby Pro Bean Bag Poser is specially made with the highest quality of soft & durable faux leather. With the perfect amount of grip, this poser will keep blankets in place. It is also easy to wipe clean after little (unplanned) accidents! LARGE SURFACE AREA & BUILT IN HANDLE - The PoseBaby Ottoman has a large and impressionable surface area and is designed for dynamic posing. The large and flat surface area makes for a safe, sturdy and flexible posing pillow, allowing for versatility in posing. The PoseBaby PRO Posing Pod is also designed with a built-in handle to make transporting easier. MADE FOR EASY FILLING - Comes with a large and convenient anti-burst inner bag and a special safety pull-away zipper for easy filling and reliable closure. (No velcro closure!) The PoseBaby Infant Poser is one of the only Professional Poser's on the market that comes with an inner bag & specialty pull-away zipper for safety. This pillow is durable and designed to last. **INCLUDES SAFETY ZIPPER** The PoseBaby Pro Beanbag includes a safety zipper that is meant to be pulled away after the first closing. This is a safety precaution as our #1 priority is always Newborn Photography Safety!